Heathrow Airport officials have been clearing a backlog of flights which were cancelled to the bad weather. Additional staff were on duty on Saturday to cater for 500 travellers re-booking their flights, said airport operator BAA. 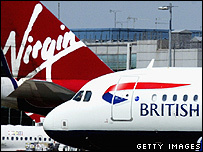 Ten out of 275 British Airways (BA) departures have so far been cancelled, said the airline. "Things are running smoothly," said a BA spokesman. "Flights are getting away but it has been a very busy day." Heavy rain and flash floods on Friday led to 141 flights in and out of the west London airport being scrapped. "The severe weather [on Friday] had an impact on air traffic across the UK and Europe and led to 141 cancellations," said a BAA spokesman. Most of the flight cancellations were due to flight crews and aircraft being out of position as a result of the disruption.